Our online documentation system includes installation guides and manuals, is easily searchable, and allows you to quickly find information. Search for answers, ask questions, and network with your peers in the Meraki Community. Log in to submit cases. You will need your Cisco Meraki account number in order to access telephone support. This number is available on the help tab of the Meraki dashboard. Provide the highest quality and fastest possible support directly to Cisco Meraki customers. Deliver customer satisfaction; internally, the Cisco Meraki support team is evaluated on their customer satisfaction metrics and are responsible for delivering consistent measured customer satisfaction. Ensure Cisco Meraki authorized resellers are properly supported during field installations and troubleshooting activities, assuming the support request is in regards to a currently licensed Meraki product. Effectively track and coordinate customer interactions and support activities. All customers have an explicit support owner at all times. Normally this is a Cisco Meraki support team member; however, during pre-sales product it could be a Cisco Meraki Systems Engineer, VAR, or other field sales resource. All legitimate support requests are the responsibility of Cisco Meraki Support until closure, unless there is explicit agreement between Meraki Support and the customer to transfer management of the case to another party. Customer satisfaction is the responsibility of the Cisco Meraki Support Team. If a case is reassigned to another Meraki resource, or a Cisco Meraki authorized reseller, Cisco Meraki reserves the right to expect timely response from that party or Meraki Support may intervene to ensure customer satisfaction. The Cisco Meraki cloud management platform provides Support engineers with rich visibility into customer networks, resulting in faster diagnosis and resolution of cases. Our policies, outlined below, ensure that customer information is only accessed with prior consent, for the purposes of resolving a support case. On rare occasions, support may view network status without prior notice to identify and diagnose system-wide issues. In these cases, network configuration information, including security settings and policies, will not be accessed. Customers may remove Support's access to a network entirely by selecting "Prevent Meraki support from viewing this organization" in the Dashboard. Once checked, Support will not be able to access any aspect of the network. Customers will need to uncheck this box if technical assistance is required. Meraki support operates 24x7 support out of five support centers based in San Francisco, Chicago, London, Shanghai, and Sydney. Meraki has no support-specific licensing. Customers may open an unlimited number of support cases with the purchase of any device license, and can contact Meraki by phone or email. Service providers and resellers who offer fully managed network services using Meraki devices likewise may open an unlimited number of support cases and interact directly with Meraki support centers. End customers (i.e. guests at a hotel) accessing networks supported or provided by service providers will contact the help desk for that Meraki Partner. Cisco Meraki’s cloud infrastructure is covered under a 99.99% SLA and the Cisco Meraki Infrastructure team manages it 24×7×365 to ensure high availability. In the extremely unlikely event of a cloud infrastructure interruption, user traffic and data continues to flow, and Meraki Support provides an emergency support SLA of 15 minutes. Non-emergency support cases opened via email will be answered within one business day; usually within 2 hours. Emergency support is offered exclusively via telephone to ensure that Meraki engineers can conduct appropriate troubleshooting and technical response. Phones at Meraki technical support centers are staffed 24×7×365 to ensure that one-on-one, phone-based technical support is always available from Meraki’s technical support engineers. Meraki Support will ship new devices overnight from global distribution centers to a customer-specified location within 1 business day of any support case requiring the Advanced Replacement RMA of any device. Delivery times to certain countries or remote destinations can vary. For Hours/SLA information on legacy Meraki “Pro” networks, please contact Meraki Support. In the event that any case cannot be immediately resolved, Meraki Support will escalate that case to appropriate engineering personnel within Support, Product and Sales Engineering according to the following schedule and priorities. Generally, escalations are major issues that require notification and/or intervention by key portions of the company in order to ensure timely issue resolution. Priority 1 — Major Impact: The network is inoperable or the performance of the network is so severely reduced that Licensee cannot reasonably continue to operate the network because of the Error and the Error cannot be circumvented with a Workaround. Priority 2 — Moderate Impact: The network’s performance is significantly degraded such that Licensee’s Use of the network as permitted is materially impaired, but the Error can be circumvented with a Workaround. Priority 3 — Minor Impact: Licensee is experiencing a performance, operational, or functional Error that can be circumvented with a Workaround and the Error causes only minimal impact to the Licensee’s ability to Use the network as authorized. Priority 4 — General Questions: There is no issue with network performance or operation. These include standard questions on network configuration or functionality, network enhancement requests, or documentation clarification. Cisco Meraki will trigger case escalations as necessary by priority level to ensure timely resolution of all cases. Response time: failure to provide response or resolution within the timeframes described in the service level section above may generate an escalation. Issue severity: system outage automatically generates an escalation. Other severe product issues may generate an escalation at the discretion of Cisco Meraki personnel listed above. The team above is notified of the escalation in order of severity. If fully escalated, Director of Services takes ownership of issue until resolution. To comply with best practices, all RMA requests should only be processed after a technical support case has been opened and proper troubleshooting has taken place. Products covered by the Cisco Meraki lifetime warranty are eligible for advance replacement. Advance replacement orders will ship within 1 business day. All Cisco Meraki hardware products come with either a one-year or lifetime warranty, as specified on the relevant Cisco Meraki data sheet. In the event a customer RMA request is approved, Cisco Meraki will email an RMA number and a return shipping label free of charge. Any replacement unit will ship within five business days of receiving defective units as stock allows. If no defect is found, the RMA request will be rejected and the customer will be notified. Cisco Meraki may find it necessary to discontinue products for a number of reasons, including product line enhancements, market demands, technology innovation, or the products simply mature over time and are replaced by functionally richer products. We have set our end-of-life (EOL) policy to help customers better manage their product end-of-life transition. When a product reaches EOL, Meraki is committed to communicating important milestones throughout the EOL period. These notifications will include the initial EOL notification, the End of Sale (EOS) announcement, and the End of Support (EOST) dates, as well as other key information pertaining to Cisco Meraki products. Any products being discontinued will be announced as End of Sale and identified on the Cisco Meraki website up to six months prior to the discontinuation and EOS date (also known as the last order date). On the end of sale date, discontinued hardware products and related device-specific licenses are removed from the price list and are no longer available for purchase. Cisco Meraki typically provides support for a given product for a period of seven (7) years after the EOS date. If the discontinued product is not available for replacement or repair of an in-warranty return, Cisco Meraki may replace the discontinued product with functionally equivalent hardware and transfer the remaining license term from the replaced product to the replacement hardware. New software features available for the management software may not be compatible with the legacy hardware functionality or with the firmware running on the legacy hardware. If either of the first two situations above occurs, then we will use our best efforts to provide the customer with a workable solution for upgrading from the legacy hardware and, failing that, will credit the value of any remaining license time attributable to the legacy hardware to the customer’s Dashboard organization on a prorated basis. End-of-Sale Announcement: Date of official end-of-sales notice, typically six months prior to the last order date. End-of-Sale (EOS) Date: The last date to order the product through Cisco Meraki point-of-sale outlets. After this date, the product is no longer for sale via any channel. End-of-Support (EOST) Date: The last date a product will be affirmatively supported by Cisco Meraki, typically seven years following the EOS Date. In some limited cases, Cisco Meraki may also find it necessary to discontinue certain features. For more information, see the WAN Optimization feature retirement notice. *Original and replacement modular power supply units and fans for MS and MX Products included in lifetime warranty. **Product lifetime ends concurrently with product End-of-Support (EOST) Date as described in Cisco Meraki's End of Life (EOL) Policy. If you are experiencing hardware issues, for any product under warranty (as described above), please contact Cisco Meraki support by logging in to dashboard (Help > Get help) or by calling us. To request a return materials authorization (RMA), please complete the RMA request form in the Meraki dashboard. If your RMA request is approved, Cisco Meraki will email you an RMA number and a return shipping label free of charge. We will ship replacement units within five business days of receiving your defective units. If no trouble is found, we will contact you before taking further action. If you require advance replacement, please call Cisco Meraki technical support. Advance replacement orders will ship within 1 business day. If you require replacement of Meraki products covered by Meraki Now services, please call Meraki technical support and request Meraki Now advance replacement. Please include the Meraki Now service tier and affected device serial number (SN) with your request. If you would like to return units from a product trial, please go to your product trial webpage (using the link your rep provided you with) and go to the returns tab to fill out the RMA request form. If your trial hardware was shipped to the US, Canada, or an EU member country you will also be able to print out a return shipping label and ship the product back to Cisco Meraki at no charge to you. To request a refund, please complete our RMA request form. Please contact Cisco Meraki directly for all returns, including product purchased through distributors or resellers. Please return units in their entirety. That is, include all power supplies, antennas, and other components along with the original product box. Please use the original shipping carton and packaging material. If this is not possible, use another shipping carton with padding to protect the units from damage during shipping. DO NOT ship a product without a carton. The customer will be charged for product that is damaged due to insufficient packaging. Once you have received your RMA number from Cisco Meraki via email, write this RMA number in large letters on the exterior of the shipping carton. Shipments to Cisco Meraki without an RMA approval will not be processed. If Cisco Meraki approves your RMA request, you will receive a confirmation email containing an RMA number within two business days. The address to which the product should be sent will also be included in that email. Cisco Meraki will provide a pre-paid return shipping label for warranty replacement return shipments. Cisco Meraki will also provide a pre-paid return shipping label for free trial return shipments from US (including Puerto Rico), any EU member country, Australia, Canada, Chile, Colombia, Costa Rica, Ecuador, Indonesia, Japan, Mexico, New Zealand, Panama, Peru, the Philippines, Singapore, South Korea, Thailand, the United Arab Emirates, and the United Kingdom. For all other returns it is your responsibility to coordinate and pay for return shipping back to Cisco Meraki using the carrier of your choice. Cisco Meraki recommends that the return package has a tracking number and is insured for the proper value of its contents. Cisco Meraki is not responsible for packages lost by carriers. Meraki is adopting the Cisco Online Privacy Statement, effective January 26, 2017. For existing customers, this will be effective on February 9, 2017. Please click here to see the Cisco Online Privacy Statement. Please review the FAQs below about this transition. Q. Why is Meraki making this change? Q. When will the change to Cisco Online Privacy Statement become effective? A. For existing Meraki Customers, the change will become effective on February 9, 2017. For new customers, the change is effective immediately. Q. How can I get more information about the Cisco Online Privacy Statement? Q. How do I object to my personal information being processed under the Cisco Online Privacy Statement? Q. Will I now receive marketing from Cisco not related to Meraki Products and Services? A. This update does not change your marketing or communication preferences. You will receive marketing based on the preferences you have previously stated. You can unsubscribe from marketing messages from Cisco or Meraki at any time either by following the instructions contained within the email or emailing us a [email protected] (for messages from Cisco) or [email protected] for messaged from Meraki. Please click here for fax and postal mail information. TRUSTe's Dispute Resolution process is only available in English. The TRUSTe certification covers our collection, use and disclosure of information we collect through our Services. The use of information collected through our Services shall be limited to the purpose of providing the service for which the customer has engaged Meraki. "Personal Information," as used in this Policy, is information that specifically identifies an individual, such as an individual's name, address, telephone number, or e-mail address. Personal Information also includes information, such as demographic information (e.g., date of birth, gender, geographic area, and preferences), when any of this information is linked to Personal Information that identifies that individual. Personal Information does not include "aggregate" or other non-personally identifiable information. Aggregate information is information that we collect about a group or category of products, services, or users that is not personally identifiable or from which individual identities are removed. We may use and disclose aggregate information, and other non-personally identifiable information, for various purposes at our sole discretion and without notice or liability to you. User Accounts and Profiles. Our Services may give you the ability to register for an account or to create and update a user profile. If we offer user account or profile functionality on the Services, we will collect the Personal Information that you provide to us in the course of registering for an account or creating or updating a user account or profile. This information may include, for example, name, postal address, telephone number, e-mail address, and related demographic information about you. We may indicate that some Personal Information is required for you to register for the account or to create the profile, while some is optional. Logging into Networks. Certain networks using our Services may require users to establish or use login credentials. In connection with supporting this log-on functionality, we may collect information such as email addresses, telephone numbers, or user or administrator-created usernames, along with user-created or administrator-created passwords, to facilitate such log-on functionality and otherwise to provide our Services. Correspondence. If you contact us by e-mail, using a contact form on the Services, or by other means, we collect the Personal Information contained within, and associated with, your correspondence. Testimonials. We display testimonials of satisfied customers on our site in addition to other endorsements. With your consent we may post your testimonial along with your name. Information Related to Data Collected for our Customers. Meraki collects information under the direction of its customers, and has no direct relationship with the individuals whose personal data it processes. If you are an individual who makes use of services offered by one of our customers and would no longer like to be contacted by that customer, please contact the customer that you interact with directly. We may transfer personal information to companies that help us provide our Services. Transfers to subsequent third parties are covered by the service agreements with our customers. When you use or visit our Services, some information is collected automatically. For example, when you access our Services, we automatically collect your browser’s Internet Protocol (IP) address, your browser type, the nature of the device from which you are visiting the Services (e.g., a personal computer or a mobile device), identifiers for any handheld or mobile device that you may be using, the Web site that you visited immediately prior to accessing any Web-based Services, the actions you take on our Services, and the content, features, and activities that you access and engage with on our Services. We also may collect information regarding your interaction with e-mail messages from Meraki, such as whether you opened, clicked on, or forwarded a message. We may collect this information passively using technologies such as standard server logs, cookies, and clear GIFs (also known as “Web beacons”). We use passively-collected information to administer, operate, maintain and improve our Services and our other services and systems and to provide content that is tailored to you. If we link or associate any information gathered through passive means with Personal Information, or if applicable laws require us to treat any information gathered through passive means as Personal Information, we treat the combined information as Personal Information under this Policy. Otherwise, we use and disclose information collected by passive means in aggregate form or otherwise in a non-personally identifiable form. Please be aware that in the course of your use of the Services, websites or other services provided by third parties ("Third-Party Services"), including marketing or website optimization vendors, may set cookies on your hard drive or use other means of passively collecting information about your use of their Third-Party Services or other services or content. To do this, they may use first-party cookies (which are set by the same domain your browser is receiving data from) or third-party cookies (which are set by a different domain). Meraki also may make non-personally identifiable information available to Third-Party Services, and these Third-Party Services may collect such information, to assist such parties in understanding our users’ activities and usage patterns on the Services. If desired, you may use the Google Analytics Opt-out Browser Add-on to opt-out of having information collected by Google Analytics. Additionally, please be aware that Google and other third-party vendors may place or recognize one or more unique cookies on your computer when you use the Services, and may record information to these cookies based upon your activities on our Services and on third-party websites and other Third-Party Services. Google and these other third-party vendors may use information about those activities to inform, optimize, and serve advertisements. In particular, we may use Google and other third-party vendors to engage in “remarketing,” in which advertisements you see on third-party websites and services may be based on your prior visits to our Services. We may receive information about you, including Personal Information, from affiliated and unaffiliated third parties, and may combine this information with other Personal Information we maintain about you in order to ensure we have accurate information. If we do so, this Policy governs any combined information that we maintain in personally identifiable format. We may also use Personal Information you provide to contact you regarding products, services, and offers, both from ourselves and third parties, that we believe you may find of interest. We allow you to opt-out from receiving marketing communications from us as described in the “Choice” section below. Information about our users, including Personal Information, may be disclosed and otherwise transferred to an acquirer, successor, or assignee as part of any merger, acquisition, debt financing, sale of company assets, or similar transaction, as well as in the event of an insolvency, bankruptcy, or receivership in which Personal Information is transferred to one or more third parties as one of our business assets. We may disclose Personal Information and other information to our parent company and to other corporate affiliates of ours. These affiliated third-party companies may use and disclose Personal Information and other information that we disclose to them in accordance with their privacy policies and procedures. We may disclose Personal Information and other information to channel partners, such as resellers, of ours. These third parties may use such Personal Information and other information that we disclose to them for purposes such as marketing our products and services to you. We also may disclose Personal Information and other information if we believe that doing so is legally required or is in our interest to protect our property or other legal rights (including, but not limited to, enforcement of our agreements) or the rights or property of others, or otherwise to help protect the safety or security of our Services or other users of the Services. If you receive commercial e-mail from us, you may unsubscribe at any time by following the instructions contained within the e-mail. You may also opt-out from receiving commercial e-mail from us, and any other promotional communications that we may send to you from time to time (e.g., by postal mail) by sending your request to us by e-mail at [email protected] or by writing to us at the address given at the end of this policy. Additionally, if we offer user account functionality on the Services, we may allow you to view and modify settings relating to the nature and frequency of promotional communications that you receive from us. You may choose to opt-out of the sharing of your personal information with third parties for their direct marketing purposes at any time by e-mailing us at [email protected]. Once we receive your opt-out request, we will no longer disclose your Personal Information to third-parties for their direct marketing purposes. Please be aware that this opt-out does not prohibit disclosures of Personal Information or other information made for non-direct marketing purposes. If we offer the ability to create user accounts or profiles on our Services, you may have the ability to access and update certain categories of Personal Information that you provide to us by logging in to your account and accessing your account settings. If you wish to access, amend, or delete any other Personal Information we hold about you, you may contact us at [email protected]. If you request access to your account including deletion requests on any of our Services (via a user settings page, by e-mail, or otherwise) including requests to remove testimonials that contain Personal Information, we will respond to your access requests within 30 days. Please note that we may need to retain some of your Personal Information in order to satisfy our legal obligations, or where we reasonably believe that we have a legitimate reason to do so. Please note that Meraki has no direct relationship with the individuals whose personal data we process on behalf of our customers. An individual who seeks access, or who seeks to correct, amend, or delete inaccurate data should direct his or her query to our customer (the data controller). If the customer requests Meraki to remove the data, we will respond to their request within 30 days. We will retain personal data we process on behalf of our customers for as long as needed to provide services to our customer. Meraki will retain and use this personal information as necessary to comply with our legal obligations, resolve disputes, and enforce our agreements. The Services may contain links to other Web sites or other Third-Party Services that we do not own or operate. If you choose to visit or use any Third-Party Services or products or services available on or through such Third-Party Services, please be aware that this Policy will not apply to your activities or any information you disclose while using those Third-Party Services or any products or services available on or through such Third-Party Services. We are not responsible for the privacy practices of these Third-Party Services or any products or services on or through them. Additionally, the Services may contain links to Web sites and services that we operate but that are governed by different privacy policies. We encourage you to carefully review the privacy policies applicable to any Web site or service you visit other than the Services before providing any Personal Information on them. Children’s safety is important to us, and we encourage parents and guardians to take an active interest in the online activities of their children. Our Services are not directed to children under the age of 13, and we do not knowingly collect Personal Information from children under the age of 13 without obtaining parental consent. If we learn that we have collected Personal Information from a child under the age of 13 on our Services, we will delete that information as quickly as possible. If you believe that we may have collected any such Personal Information on our Services, please notify us at [email protected]. Many of our servers and data centers are located in the United States. If you choose to use the Services from outside the U.S., then you should know that you may be transferring your Personal Information outside of your region and into the U.S. for storage and processing. By providing your Personal Information to us through your use of the Service, you agree to that transfer, storage, and processing in the U.S. Also, we may transfer your data from the U.S. to other countries or regions in connection with storage and processing of data, fulfilling your requests, and operating the Services. You should know that each region can have its own privacy and data security laws, some of which may be less stringent as compared to those of your own region. We use certain security measures in an effort to protect Personal Information from accidental loss, disclosure, misuse, and destruction. The security of your Personal Information and our customers’ information is important to us. When you enter sensitive information (such as login credentials) we encrypt the transmission of that information using secure socket layer technology (SSL). Please be aware, however, that no data security measures can be guaranteed to be completely effective. Consequently, we cannot ensure or warrant the security of any information that you provide to us. You transmit information to us at your own risk. If Meraki learns of a security systems breach, then we may attempt to notify you electronically so that you can take appropriate protective steps. Meraki may post a notice through the Services if a security breach occurs. Depending on where you live, you may have a legal right to receive notice of a security breach in writing. To receive a free written notice of a security breach, you should notify us at [email protected]. We may occasionally update this Policy. When we do, we will post the updated Policy and revise the “last updated” date at the beginning of the Policy. If we change this Policy in a manner that materially alters your rights or obligations under this Policy, we will use reasonable efforts to notify you of the change. For example, we may send a message to your email address, if we have one on file, or generate a pop-up or similar notification when you access the Service for the first time after such material changes are made. We encourage you to periodically review this Policy to stay informed about how we collect, use, and disclose Personal Information. Your continued use of the Services after the revised Policy has become effective indicates that you have read, understood and agreed to the current version of this Policy. The terms "you," "your," and "yours" refer to you, the user of the Site. The terms "Meraki," "we," "us," and "our" refer to Meraki, LLC. We may periodically make changes to these Terms, in our sole discretion. When we do, we will update the "Last Updated" date above. It is your responsibility to review the most recent version of these Terms and remain informed of any changes. You agree that your continued use of the Site after the effective date of any changes will constitute your acceptance of the changed Terms for your continued use. You must register for an account to use certain Meraki services. Your registration for and use of an account will be governed by the Meraki End Customer Agreement, available at http://www.meraki.com/support/#policies:eca, and any other applicable agreement related to your use of particular Meraki software and products. Subject to these Terms, Meraki grants you a limited, revocable license to access and use the Site solely to support your use of Meraki products and services within your organization as intended by Meraki. No other use of the Site is authorized. Your use of any software you download from the Site is governed by the separate license terms accompanying or referenced in that software or download. You must comply with all applicable laws when using the Site. Except as may be expressly permitted by applicable law or expressly permitted by us in writing, you will not, and will not permit anyone else to: (a) store, copy, modify, distribute, or resell any information or material available on the Site ("Site Content") or compile or collect any Site Content as part of a database or other work; (b) use any automated tool (e.g., robots, spiders) to use the Site or store, copy, modify, distribute, or resell any Site Content; (c) rent, lease, or sublicense your access to the Site; (d) use the Site or Site Content for any purpose except for your own personal use; (e) circumvent or disable any digital rights management, usage rules, or other security features of the Site; (f) reproduce, modify, translate, enhance, decompile, disassemble, reverse engineer, or create derivative works of the Site or Site Content; (g) use the Site in a manner that threatens the integrity, performance, or availability of the Site; or (h) remove, alter, or obscure any proprietary notices (including copyright notices) on any portion of the Site or Site Content. We or our affiliates or licensors, or applicable third parties, retain all right, title, and interest in and to the Site and Site Content and any trademarks, logos, or service marks displayed on the Site or in Site Content ("Marks"). The Site, Site Content, and Marks are protected by applicable intellectual property laws and international treaties. You are not permitted to use any Marks without the prior written consent of Meraki or such third party which may own the Mark. Meraki, the Meraki Logo, Meraki Dashboard, Stumbler, and Mapper are among the trademarks of Meraki or its affiliates. Some of the information on this Site may contain projections or other forward-looking statements regarding future events or the future financial performance of Meraki and/or Cisco. We wish to caution you that these statements are only predictions and that actual events or results may differ materially. We refer you to the documents Cisco files from time to time with the Securities and Exchange Commission, specifically, CiscoÕs most recent Form 10-K, Form 10-Q, and Form 10-Q/A. These documents contain and identify important factors that could cause the actual results to differ materially from those contained in our projections or forward-looking statements, including, among others, potential fluctuations in quarterly results, dependence on new product development; rapid technological and market change, acquisition strategy, manufacturing risks, risks associated with Internet infrastructure, volatility of stock price, financial risk management, and future growth subject to risks. The Site may contain links to third party products, services, and websites. We exercise no control over any third party products, services, and websites and we are not responsible for their performance, do not endorse them, and are not responsible or liable for any content, advertising, or other materials available through the third party products, services, and websites. We are not responsible or liable, directly or indirectly, for any damage or loss caused to you by your use of or reliance on any goods or services available through the third party products, services, and websites. From time to time, we may offer promotions to Site visitors or registered Site users. To be eligible for a promotion, you must, for the duration of the promotion, reside in a jurisdiction in which the promotion is lawful. If you take part in any promotion, you agree to be bound by the specific promotion rules and by the decisions of Meraki and our designees, which are final in all matters relating to any promotion. Any awards provided by us or our sponsors or partners are at our sole discretion. We and our designees reserve the right to disqualify any entrant or winner in our absolute discretion without notice. Any applicable taxes on any award are the sole responsibility of each winner. Meraki may provide you with a mechanism to provide feedback, suggestions, and ideas about the Site or us ("Feedback"). You agree that we may, in our sole discretion, use the Feedback you provide in any way, including in future modifications to the Site, our products, or services. You hereby grant us a perpetual, worldwide, fully transferable, irrevocable, royalty-free license to use, reproduce, modify, create derivative works from, distribute, and display the Feedback in any manner for any purpose. YOUR USE OF THE SITE AND SITE CONTENT, INCLUDING YOUR SUBMISSION OF FEEDBACK, IS AT YOUR SOLE RISK. THE SITE AND SITE CONTENT ARE PROVIDED ON AN "AS IS" AND "AS AVAILABLE" BASIS. MERAKI EXPRESSLY DISCLAIMS ALL WARRANTIES OF ANY KIND, WHETHER EXPRESS OR IMPLIED, INCLUDING, BUT NOT LIMITED TO THE IMPLIED WARRANTIES OF MERCHANTABILITY, FITNESS FOR A PARTICULAR PURPOSE, TITLE, AND NON-INFRINGEMENT, AND ANY WARRANTIES ARISING FROM A COURSE OF DEALING, USAGE, OR TRADE PRACTICE. WE DO NOT GUARANTEE THE ACCURACY, COMPLETENESS, OR USEFULNESS OF THE SITE OR SITE CONTENT, AND YOU RELY ON THE SITE AND SITE CONTENT AT YOUR OWN RISK. ANY MATERIAL YOU RECEIVE THROUGH THE SITE IS OBTAINED AT YOUR OWN DISCRETION AND RISK AND YOU WILL BE SOLELY RESPONSIBLE FOR ANY DAMAGE TO YOUR COMPUTER OR LOSS OF DATA THAT RESULTS FROM THE DOWNLOAD OF ANY MATERIAL THROUGH THE SITE. NO ADVICE OR INFORMATION, WHETHER ORAL OR WRITTEN, OBTAINED BY YOU FROM MERAKI OR THROUGH OR FROM THE SITE WILL CREATE ANY WARRANTY NOT EXPRESSLY STATED IN THESE TERMS. SOME STATES MAY PROHIBIT A DISCLAIMER OF WARRANTIES AND YOU MAY HAVE OTHER RIGHTS THAT VARY FROM STATE TO STATE. MERAKI WILL NOT BE LIABLE TO YOU OR TO ANY THIRD PARTY FOR ANY INDIRECT, INCIDENTAL, SPECIAL, CONSEQUENTIAL, OR EXEMPLARY DAMAGES, INCLUDING BUT NOT LIMITED TO, DAMAGES FOR LOSS OF PROFITS, GOODWILL, USE, DATA OR OTHER INTANGIBLE LOSSES (EVEN IF MERAKI HAS BEEN ADVISED OF THE POSSIBILITY OF THESE DAMAGES), RESULTING FROM YOUR USE OF THE SITE AND SITE CONTENT. UNDER NO CIRCUMSTANCES WILL MERAKIÕS TOTAL LIABILITY OF ALL KINDS ARISING OUT OF OR RELATED TO YOUR USE OF THE SITE OR SITE CONTENT (INCLUDING BUT NOT LIMITED TO WARRANTY CLAIMS), REGARDLESS OF THE FORUM AND REGARDLESS OF WHETHER ANY ACTION OR CLAIM IS BASED ON CONTRACT, TORT, OR OTHERWISE, EXCEED $50. BECAUSE SOME STATES DO NOT ALLOW THE EXCLUSION OR LIMITATION OF LIABILITY FOR CONSEQUENTIAL OR INCIDENTAL DAMAGES, THE ABOVE LIMITATION MAY NOT APPLY TO YOU, IN WHICH CASE MERAKIÕS LIABILITY WILL BE LIMITED TO THE MAXIMUM EXTENT ALLOWED BY APPLICABLE LAW. You will indemnify and hold Meraki, and its subsidiaries, affiliates, officers, agents, and employees, harmless from any costs, damages, expenses, and liability caused by your use of the Site or Site Content, your submission of Feedback, your violation of these Terms, or your violation of any rights of a third party through use of the Site or Site Content. These Terms will be governed by and construed in accordance with the laws of the State of California without regard to principles of conflicts of law. You submit to the jurisdiction of the federal or state courts of or located in Santa Clara County, California, with respect to any action or proceeding arising out of or in any way related to these Terms, and you hereby waive any venue or other objection which you may have to any such action or proceeding being brought in the federal or state courts of in Santa Clara County, California. No failure or delay by us in exercising any right under these Terms will constitute a waiver of that right. If any portion of these Terms is held invalid by a court of competent jurisdiction, then such portion will be deemed to be of no force or effect, and these Terms will be construed as if such portion had not been included. The headings used in these Terms are for convenience of reference only and do not affect the meaning or construction of these Terms. You will receive an email from [email protected] to the email listed in the purchase order once the order is accepted. This contains your order number, so look for this email and retain your order number for your records. Once your order ships you will receive an email notification to the email listed in your Purchase Order from Cisco Meraki with tracking number for the shipment. You may want to double check in your bulk email folder in case you do not receive this email within 48 hours of the time you placed the order. All orders will generally be processed the same day and shipped within 2 business days. Delays may occur if there are special shipping requests or missing information. If you have not received notification of shipment within 3 business days, please check for an email from [email protected] as there is likely a problem with your order. Shipment is dependent on available stock. While stock outs are rare, they can happen. If you have a time sensitive order you can check availability with your sales representative. Once your order has been accepted and submitted for fulfillment there are limited modifications that you can make to your order. Please contact [email protected] as soon as possible if you require some adjustment. You may be responsible for any applicable adjustment, handling and/or shipping fees if applicable. Cisco Meraki offers 4 different plug types for the power adapters that ship with the routers. All power adapters accept power input 100-240 V 50/60 Hz AC. There are 4 variations of input plug types as follows. As Cisco Meraki grows, so too will the list of countries in which Cisco Meraki product is certified. Cisco Meraki currently has product certified in over 45 countries worldwide. If you have specific questions regarding Cisco Meraki certifications, please contact your sales representative. In accordance with applicable law, Cisco Meraki collects tax/VAT in regions where Cisco Meraki has a presence. Sales tax or VAT will be applied to the total amount of the order and is based on the shipment's destination state and local sales tax or VAT rates. Qualified groups and individuals may place a sales tax-exempt order once we have your tax-exempt certificate on file. Fax or email a copy of your state- or federal government-issued certificate to 415-632-5899. Tax-exempt orders have to be made by contacting [email protected]. Cisco Meraki will ship using UPS if product is shipped on Cisco Meraki’s account. The most common methods used are UPS Ground, UPS 3 Day, UPS 2 Day, UPS Overnight, UPS Overnight Early AM and UPS Overnight Saturday Delivery. Cisco Meraki is capable of shipping using most carriers and methods if the customer is shipping on a customer’s account. Below is the UPS Ground map. NOTE: Business Days are Monday through Friday, excluding holidays observed by UPS. Expedited shipments within the US using an expedited method will generally arrive in 1-3 business days. Cisco Meraki will ship to Canada using either UPS Ground or Expedited services. Cisco Meraki will ship any UPS or FedEx shipment to Canada using a paperless process. The commercial invoice is therefore electronic and will not be included in the shipment. Cisco Meraki has the ability to ship using most carriers if shipping on the customer’s account. If Cisco Meraki has any concerns or issues with the carrier you selected you will be contacted. Cisco Meraki will only send shipments to Canada using EXW (Ex Works) incoterms. That means the customer will be the importer of record and will be responsible of all duties, taxes/VAT, and brokerage fees. Contact your local customs office for details. *Excludes any issues that could arise with customs. It is very rare that Cisco Meraki experiences any issues with Canadian customs. Cisco Meraki can ship to Mexico using expedited services. Cisco Meraki will ship any UPS or FedEx shipment to Mexico using a paperless process. The commercial invoice is therefore electronic and will not be included in the shipment. Expedited shipments to Mexico using an expedited method will generally arrive in 2-5 business days. Excludes any issues that could arise with customs. It is very rare that Cisco Meraki experiences any issues with Mexican customs. Cisco Meraki will only send shipments to Mexico using EXW (Ex Works) incoterms. That means the customer will be the importer of record and will be responsible of all duties, taxes/VAT, and brokerage fees. Contact your local customs office for details. Cisco Meraki cannot deliver to a P.O. Box in the United States, Mexico, or Canada. Customers that place an order with a P.O. Box delivery address will be contacted for an alternative address. Other questions about shipping, please contact [email protected]. Cisco Meraki will ship using UPS if product is shipped on Cisco Meraki’s account. The most common methods used are UPS Standard and UPS Expedited. Expedited shipments will generally arrive at their destination in 1-3 business days. For most addresses, PO Boxes are not acceptable delivery addresses. If your shipping address must include a PO Box Cisco Meraki cannot guarantee delivery. Cisco Meraki will only send Europe shipments using EXW (Ex Works) incoterms. That means the customer will be the importer of record and will be responsible of all duties, taxes/VAT and brokerage fees. Contact your local customs office for details. As a rule Cisco Meraki will ship any UPS or FedEx shipment to a non-EU country using a paperless process. The commercial invoice is therefore electronic and will not be included in the shipment. Cisco Meraki has the ability to ship using most carriers if shipping on a customer’s account. If Cisco Meraki has any concerns or issues with the carrier you selected you will be contacted. For most addresses, P.O. Boxes are not acceptable delivery addresses. If your shipping address must include a P.O. Box Cisco Meraki cannot guarantee delivery. Cisco Meraki will only ship international shipments using EXW (Ex Works) incoterms. That means the customer will be the importer of record and will be responsible of all duties, taxes/VAT and brokerage fees. Contact your local customs office for details. As a rule Cisco Meraki will ship any UPS or FedEx shipment using a paperless process. The commercial invoice is therefore electronic and will not be included in the shipment. Here at Meraki, we aim to keep our legal terms simple, transparent, and to the point. This End Customer Agreement (this “Agreement”) is the main agreement between us (Meraki LLC, a Delaware limited liability company (“Meraki”)) and you, the end customer and purchaser of our products (“Customer”). It forms a binding agreement between us and you, and it governs your purchase and use of our products. You and Meraki may each be referred to as a “Party” and collectively as the “Parties.” Please keep in mind that your use of the Products after changes to this Agreement are published at https://meraki.cisco.com/support/#policies:eca will constitute your acceptance of the changes. Any material changes are considered effective upon the earlier of (i) your continued use of the Products once you know about the changes, and (ii) 30 days after they are published. Okay, with all that in mind, let’s dive in. Heads-up: there’s a glossary of defined terms at the end. Article 1 Licenses and Restrictions. 1.1. Paid Licenses. Subject to the terms and conditions of this Agreement, all the paperwork related to your purchasing being in order, and you actually paying for the Products, Meraki grants you non-sublicensable, non-exclusive, non-transferable licenses (i) to use the Firmware on the Hardware (the “Firmware Licenses”), and (ii) to use the Hosted Software via the Internet (the “Hosted Software Licenses”), in each case until the Co-Termination Date or the earlier termination of this Agreement. The Support Services we provide to you are included in the cost of the Hosted Software Licenses. The Firmware License for each item of Hardware you purchase is contingent upon you purchasing and maintaining a valid Hosted Software License, without which the Hardware will not function. 1.2. Third-Party Licenses. If any of the Products include software provided by a third party, the terms under which that software is provided to you may be found at https://meraki.cisco.com/support/#policies:thirdparty. Don’t worry, we’ve made sure you have the right to use any such software as part of the Products at no additional cost to you. 1.3. Restrictions. Let’s play nice together. Don’t (and don’t permit anyone who obtains access to your Network (a “Network User”) to) directly or indirectly, reverse engineer the Products or otherwise attempt to discover the source code or algorithms of Meraki software or hardware. 1.4. Customer Responsibilities. Similarly, please use the Hardware only in accordance with the specifications (the “Specifications”) available on our website, and keep in mind that you (not Meraki) are solely responsible for maintaining administrative control over your Hosted Software account. And, of course, it is your responsibility to comply with all applicable laws in your use of the Products, including export laws and regulations of the United States or any other country. To that end you will ensure that none of the Products are directly or indirectly exported, re-exported, or used to provide services in violation of such export laws and regulations. If Meraki detects any Products operating in violation of such laws they will be removed from your account, following written notice to you (in the form of an email). Article 2 Ownership; Customer Data. 2.1. Meraki Rights. As between you and Meraki, Meraki owns and reserves all rights with respect to the Software and all intellectual property rights with respect to the Hardware. In addition, you hereby assign to Meraki all of your interest in any feedback you convey to us related to the Products. Meraki may incorporate modifications into the Hosted Software, the Firmware and the Documentation at any time. 2.2. Customer Data. By using the Hardware, you understand and agree that you are collecting data regarding the devices that connect to your Network and how your network is being used, including the types of data described below. By means of the Hardware, you are then transferring that data to Meraki for processing and storage, including data that may contain personally identifiable information of your Network Users (collectively, “Customer Data”). That said, the Products include functionality that limits or restricts the types of information collected, and you may certainly make use of that functionality. We process and store Customer Data exclusively for the purpose of providing the Products to you, except to the extent necessary to protect our rights in any dispute with you or as required by law. It is your responsibility to provide notice to, and obtain any necessary consents from, your Network Users regarding collection, processing, and storage of Customer Data. 2.2.1. Traffic Information. “Traffic Information” means information about devices that connect to your Network, such as MAC address, device name, device type, operating system, geolocation information, and information transmitted by devices when attempting to access or download data or content (e.g., hostnames, protocols, port numbers, and IP addresses) via the Network. We process and store Traffic Information on your behalf so you can monitor the use and performance of your Network and exercise control (such as network traffic shaping) over the traffic on your Network. 2.2.2. Location Analytics. By enabling and using Location Analytics, you collect the MAC address and relative signal strength of WiFi-enabled devices that are within range of your wireless Network. Meraki does not store these MAC addresses on its servers, except in a de-identified form, and they are not stored on your Hardware. Meraki has no responsibility for whether and how you configure the API to transfer this data to non-Meraki servers or what happens to this data following such a transfer. 2.2.3. Systems Manager. If you choose to use Systems Manager, certain agent software must be installed on the mobile devices, laptops or other devices you choose to enroll. You will then, depending on the type of device, be able to perform remotely actions such as accessing and deleting files, tracking location, enforcing policies, and installing and removing apps. 2.3. Publicity. We won’t use each other’s name or trademarks without written consent, but we may use your company name and logo in customer lists on our website and collateral. Article 3 Term and Termination. 3.1. Term. This Agreement will be effective until the expiration of the Term (the “Co-Termination Date”), unless earlier terminated per Section 3.2, below. If you subsequently purchase additional Hosted Software Licenses, the Co‑Termination Date will be adjusted so that all of your Hosted Software Licenses (including the new ones) terminate on the same date. This adjusted Co-Termination Date is calculated by (i) determining the aggregate amount of time that your new Hosted Software Licenses extend past your existing Co-Termination Date, and (ii) distributing that amount of time among all your Hosted Software Licenses (including both new and existing ones) pro rata based on the one-year list price for each type of Hosted Software License. Further information is at http://meraki.cisco.com/support#policies:licensing. 3.2. Termination. You may terminate this Agreement for any reason effective upon 30 days prior written notice to Meraki. Meraki may suspend your use of the Products at any time if Meraki reasonably believes that you have breached the terms of Sections 1.3 and 2.2; if such breach remains uncured for 10 days following receipt of notice from Meraki, then Meraki may terminate this Agreement immediately. You may terminate this Agreement for cause if we breach any material obligation of ours under this Agreement and fail to cure such breach within 10 days following receipt of written notice from you. If you terminate this Agreement for cause, you will receive a refund equal to the value of the remaining time on your Hosted Software Licenses. 3.3. Effect of Termination. Upon any termination of this Agreement, the Hosted Software Licenses and Firmware Licenses will automatically terminate. Sections 2.1 and 4.3, Article 5 and Article 6 will survive any termination of this Agreement. Article 4 Warranties; Limitation of Liability. 4.1. Service Level Agreement. Meraki uses its best efforts to keep the Hosted Software up and running 24/7, but no one is perfect. The Service Level Agreement available at https://meraki.cisco.com/trust#sla is your exclusive remedy with respect to any interruptions in the availability of the Hosted Software. 4.2. Hardware Warranties. We represent to you, the original purchaser of the Hardware, that, during the Warranty Period, the Hardware will be free from material defects in materials and workmanship. Hardware not meeting the warranty above will be, at our option, (a) repaired, (b) replaced, or (c) we will refund the depreciated amount of the price you paid for such Hardware, calculated on a straight-line, five-year basis. All Hardware repaired or replaced under warranty will be warranted for the remainder of the Warranty Period. For any return permitted under Meraki’s then-current return policy (available at http://meraki.cisco.com/support/#policies:return), you will request a Return Materials Authorization (“RMA”) number in writing with the reasons for the return request. The warranties in this Section are subject to our Product End of Life Policy, available at https://meraki.cisco.com/support/#policies:eol. “Warranty Period” means the greater of one year or the warranty period set forth in the applicable Specification, commencing, in either case, on the date Hardware is shipped to the original customer. This Section 4.2 is our sole liability and your sole remedy for any breach of warranty by Meraki. 4.3. Disclaimer of Warranties. Except as set forth in Sections 4.1 and 4.2, Meraki disclaims all warranties, express, implied, statutory, or otherwise, including any implied warranty of merchantability, fitness for a particular purpose, non-infringement, or title. Meraki assumes no responsibility for any damages to Customer’s hardware, software, or other materials. Article 5 Indemnity. Customer will indemnify Meraki, its affiliates, and their employees, officers, directors, successors, assigns, agents for all losses (including reasonable attorneys’ fees) relating to any claims brought by a third party to the extent based upon: (i) grossly negligent or intentionally wrongful acts of Customer or Customer’s assistants, employees, agents, or Network Users; (ii) Customer’s unauthorized modification of the Products; (iii) Customer’s combination of the Products with other products, software, or services not supplied or specified by Meraki; or (iv) Customer’s failure to implement software modifications or patches provided by Meraki within a reasonable timeframe. Article 6 Limitation of Liability. Neither party will be liable for: indirect, incidental, exemplary, special, or consequential, damages; loss or corruption of data; or loss of revenues, profits, goodwill, or anticipated sales or savings. In no event will Meraki’s total cumulative liability to Customer and anyone who uses the Products through Customer’s account exceed the aggregate amount Customer has paid to Meraki or its resellers to purchase the Products during the prior 12-month period. Article 7 Confidentiality. Business or technical information (collectively, “Confidential Information”) provided by one of us (the “Discloser”) to the other (the “Recipient”) will be kept confidential by the Recipient and may not be used or disclosed except to perform this Agreement. Confidential Information does not include information that (a) is or was lawfully received by the Recipient from another party without confidentiality obligations, (b) becomes available in the public domain through no action or inaction of the Recipient, or (c) is developed independently by the Recipient without reference to the Discloser’s Confidential Information. If legally permissible, Recipient will provide Discloser prompt written notice if legally compelled to disclose Discloser’s Confidential Information. Article 8 Miscellaneous. This Agreement is the entire agreement between you and us and supersedes all prior agreements and understandings about all this stuff. Failure to exercise any right under this Agreement will not constitute a waiver. There are no third-party beneficiaries to this Agreement. This Agreement is governed by the laws of California without reference to conflicts of law rules. For any dispute relating to this Agreement, the Parties consent to personal jurisdiction and the exclusive venue of the courts in Santa Clara County, California. Communications we send to you electronically will be deemed to be in writing. Any notice you provide to us under this Agreement will be in writing and sent by overnight courier or certified mail (receipt requested) to the address above. If any provision of this Agreement is found unenforceable, this Agreement will be construed as if it had not been included. Meraki may assign this Agreement without the consent of Customer to Cisco Systems, Inc. or its affiliates. Article 9 Certain Definitions. The following terms not defined elsewhere in this Agreement have the respective meanings set forth below. “Location Analytics” means the location analytics features of the Hosted Software. “Documentation” means any user instructions, manuals, Specifications, or other documentation provided by Meraki at https://meraki.cisco.com/support/#documentation that relate to the Products, including any Modifications. “Firmware” means software embedded in or otherwise running on the Hardware. “Hardware” means Meraki hardware products you have purchased, received in a product trial, promotion, or beta test, or otherwise running on your Network. “Hosted Software” means our proprietary, web-based software platform, including the interface known as the “Dashboard,” Systems Manager and any API provided by Meraki. “Network” means your local area network, created in whole or in part by use of the Products. “Products” means the Hardware, the Hosted Software, the Firmware, the Documentation, and the Support Services. “Support Services” means the customer support services described at https://meraki.cisco.com/support. “Systems Manager” means Meraki’s web-based mobile device management software. “Term” means the term of the Hosted Software Licenses you have purchased or received in a product trial, as modified each time you purchase additional Hosted Software Licenses so that all your Hosted Software Licenses expires at the same time in accordance with the provisions of Section 3.1. Following a customer’s initial license purchase, if the customer purchases a new license in connection with a new hardware unit or purchases a new license for an existing hardware unit, then the term of each license (new and existing) in the customer’s organization will be automatically adjusted so that all of the customer’s licenses terminate on the same date. This concept is referred to as “co-termination” and is described in more detail below. The following is a conceptual example. Assume the original purchase included ten APs, each with a 1-year license. Also assume four months into the license term there are six additional APs added, each with a 1-year license. Extra credit is applied with value of 4 additional months * 6 additional APs = 24 additional 'AP-months'. This gives an additional 24 months / 16 total AP's in the organization = an additional 1.5 months to the license term for the whole organization. This section describes in detail each step of the co-termination algorithm which is reflected mathematically in the next section. The dollar value of each license, for purposes of the co-termination calculation, is the one-year list price of the applicable license purchased (the “Base Price” of such license — see table of base prices below). The co-termination date is then computed by, first, determining the amount of time remaining on the existing licenses in a customer’s organization by subtracting the license expiration date (available in the customer’s Dashboard account) from the current date (such difference, the “Remaining Days”). 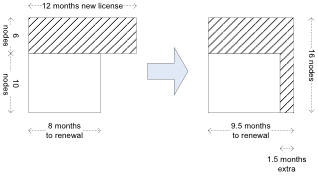 The amount of additional time allocable to the new licenses purchased is determined by multiplying a one-year period of 365 days by the term (of years) of the new licenses purchased (the “New Time Purchased”) and subtracting from the New Time Purchased the number of days of Remaining Days (such difference, the “Incremental Days,” expressed in days). The Incremental Days is then converted to a dollar-value unit of time by adding together, for each type of new license purchased, the product of (i) Incremental Time, (ii) the Base Price of the such new license-type purchased, and (iii) the number of such new license-type purchased (the sum of all such products, the “Incremental Dollar Days”). In order to determine how many additional days the new purchase adds to the license term of a customer’s organization, the daily usage rate of these dollar-value units of time must be calculated. This is determined by adding together, for each type of license in the organization, the product of (i) the Base Price of each license type and (ii) the number of licenses of such type (the sum of all such products is your Network’s “Daily License Usage Rate”). The actual number of incremental days to be added to the organization’s licenses as a result of the new purchase is calculated by dividing the Incremental Dollar Days by the Daily License Usage Rate (such quotient, the “Incremental TIme Purchased”). The new co-termination date is finally calculated by adding the Incremental Time Purchased to the Remaining Days. This section expresses in mathematical terms the detailed explanation of the co-termination algorithm described in the previous section. Note 1: In the Meraki dashboard a unit of time is one second. On January 1, 2013, you purchased and activated five Wireless MR16s with 1 year licenses for your network. Today is May 8, 2013 (127 days later). You purchase and activate two MX80s with 3-year Advanced Security licenses to be added to your network. Calculate in days the remaining time you have on your network. On January 1, 2013, you purchased and activated twenty wireless MR24s with 3-year licenses and one MX400 with a 3-year Advanced Security license for your network. Today is May 8, 2013 (127 days later). You purchase and activate an additional twenty-five wireless MR16s with 3-year licenses to be added to your network. On January 1, 2013, you purchased and activated fifteen Wireless MR16s with 5-year licenses. On June 30, 2013, you purchased and activated one MX80 with a 3-year Advanced Security license. Today is March 31, 2015 and you purchase and activate two MS42P Switch with a 1-year license. What is the exact unit of time that is used for the licensing calculations? Seconds. “Incremental Dollar Days” are actually computed in terms of incremental seconds in order to ensure precision in calculating the term of the licenses purchased. Once the exact expiration time is computed, actual license expiration is rounded to the nearest day and enforced at 9am Pacific Time on that day. What happens if I purchase a new order with multiple different license lengths (e.g., 1 MR24 with a 1-year license, 1 MS42P with a 1-year license, and 3 MX100s with 3-year licenses)? Each iteration of the co-term formula is only run with respect to licenses of the same term. So when new licenses are purchased on the same order with different terms, the co-term calculation is run multiple times. The calculations are run in the order of license addition. In the above example, the co-term calculation would first be run on the MR24 and MS42P, with the first co-term date calculated; a new co-term date would then be calculated using the first co-term date and the MX100 license for 3-years. What is the difference between license renewals and adding licenses/devices? The co-termination calculation for renewals only (no new devices being added) is slightly different because the total license time in the customer’s organization is not being ‘spread’ across any additional devices in the case of a renewal. Accordingly, when renewing the licenses for existing devices, the Incremental Dollar Days are calculated as a function of the entire term of the license (i.e., license term in years multiplied by a year of 365 days). In contrast, when purchasing a license for a new devices, the Incremental Dollar Days is calculated as a function of the “Remaining Time,” that is, the difference between the term of the new license and the amount of time remaining under the customer’s existing licenses. What happens when upgrading from enterprise to advanced security licenses? When purchasing MX products, a customer must either choose Enterprise licenses for those products or Advanced Security licenses — but not both. If a customer wants, for instance, to upgrade to the Advanced Security functionality on its MX devices and purchases new MX licenses, the co-termination calculation is re-run because the Advanced Security licenses are more expensive. This means that both the Incremental Dollar Days and the Daily License Usage Rate will be adjusted since each is calculated as a function of the Base Price of the licenses. Is there a place I can easily run a sample co-termination calculation myself? Yes. The Meraki Dashboard includes a manual co-termination calculator. To access it, first create a dashboard account for free by clicking here. Then click here to be taken to the co-termination calculator. This page contains versions of the RedBoot bootloader, Linux kernel and OpenWRT distribution modified to run on the Meraki hardware, along with associated licenses. Please note that custom firmware images are not supported by Meraki and may put your device in a non-working state. Devices with custom firmware images are not covered under the limited warranty. View the latest version of the VRT Certified Rules License Agreement. Note: Sign-ups for the Meraki SM free 100 program have been discontinued and replaced with instant free trials as of the end of January 2017. For more information, view the blog post here or contact your Meraki sales rep.
SM Free 100 is only for internal use by your company. It is not for resale, distribution or service bureau use. Limit one SM Free 100 per organization and per individual. Your use of Systems Manager is governed by our End Customer Agreement. By accepting the SM Free 100 you represent that you are authorized by your employer to accept the SM Free 100 and that you will disclose receipt of the SM Free 100 to your employer as and if required. Notwithstanding the End Customer Agreement, Cisco Meraki may terminate the Free 100 program at any time, including managing up to 100 devices at no cost – but if we do that, we’ll give you plenty of notice. The recipient is responsible for taxes and duties, if any. Please contact your Cisco Meraki rep if you have any questions.